It’s that time of year when many families coming to Hawaii have one goal in mind: take a great family snapshot for the holiday card! 1. Sunset Beach: Yes, Sunset Beach on Oahu’s North Shore is a bit “out of the way” for many families staying in Waikiki, but it’s worth the trip if you want to take a unique family photo. Because winter often brings monster waves to the North Shore, imagine snapping that family photo with a 20-foot wave in the background! 2. Hanauma Bay: Hanauma Bay is one of the best snorkeling spots in Hawaii, and it’s a spectacular place to snap amazing underwater photos. But, the view from the top of the Bay is a great place for your family to say “cheese!” In the background, you’ll see sparkling blue water and (if you have a good photographer), maybe even a snippet of the Bay itself. 3. Spitting Caves: Spitting Caves is on Kalanianaole Highway just before Hanauma Bay, and it has virtually no tourist pressure. To boot, it’s a gorgeous location for landscape photography. For family photos, go to the top of the cliff overlooking crashing waves below. There is a small cave down low that causes the waves to “spit” up, and it looks fantastic in the background. But, BE CAREFUL! 4. Pali Lookout: The Pali Lookout is a windy, yet amazing place to take family photos because it overlooks the entire Windward Side of Oahu. Throw your hair up in a pony-tail, and position yourselves along the fence overlooking the scenery, and you’re all but guaranteed an amazing family photo that will make your friends and family jealous! 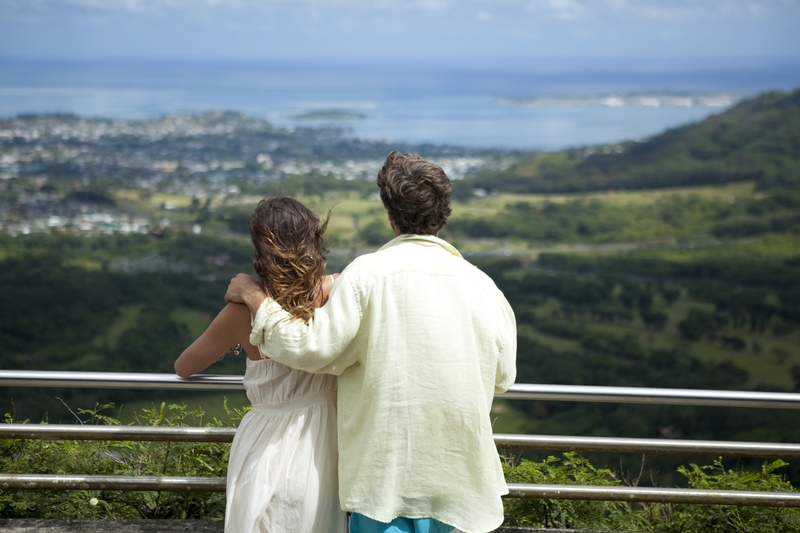 Many couples and families use the Pali Lookout as a place for great photos. Just be sure to mind the wind! 5. Makapuu Lighthouse: The Makapuu Lighthouse Trail is located in East Oahu and leads about a mile up a paved pathway that is fairly steep. The views at the top are of the lighthouse below (inaccessible by the public) as well as a sweeping vista of the ocean and islands below, which makes it a great place for family photos. It is recommended to visit this location a few hours after sunrise. At sunrise the water below is dark and doesn’t look good in photos. This is one of those rare locations where the good light happens around 10AM when the sun lights up the electric blue water below. 6. Valley of the Temples: This is a terrific location for family photos because of it’s beautiful architecture and landscape. The most famous temple in the valley is the Byodo-In temple, a Buddhist temple modeled after a 900 year-old temple in Japan. This location provides gorgeous buildings to photograph in manicured gardens. 7. Foster Botanical Gardens: This beautiful garden is a spectacular backdrop for family photos. What’s more beautiful than a lush, tropical setting for your photos? You won’t have any trouble finding colorful flowers, trees, and bushes as a background for your family. 8. Lanikai Beach: Lanikai beach is a great place for photography because it offers palm trees close to the water, the Mokulua islands in the bay, and other natural features that add a lot of needed interest to a beach landscape photo. Take your photos at sunrise for the best shots! 9. Kaena Point: Kaena Point is a mile-long strip of beach on the western-most tip of the Island of Oahu. 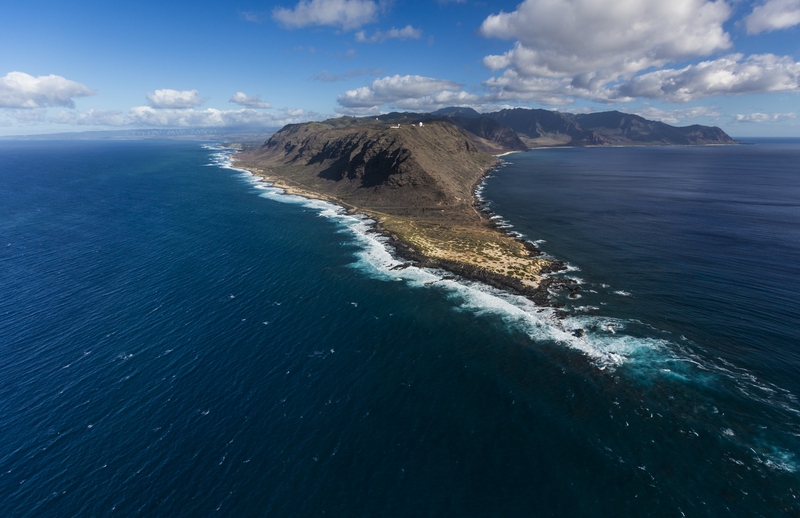 What makes this a great photography location is that it is under very little tourist pressure and offers sweeping views of the ocean bordered by a beautiful beach and the rugged Waianae Mountains. So,it’s an extraordinary site for family photos. But, the only way to get to Kaena Point is on foot via one of two short trails. Kaena Point is on the westernmost tip of Oahu and offers stunning vistas for your family photo. 10. Maunawili Falls: You’ll have to hike about three miles and takes about an hour and a half, but it’s worth the trip once you get there! You’ll be rewarded with views of a gorgeous waterfall in a lush forest. If you’re looking for a family photo that says, “Hawaii,” this is the spot. Try to go early in the morning before too many visitors come! If you’re looking for amazing things to photograph (family included or not), consider booking Hawaii Aloha Travel’s Photography Tour. The company offers three main tours: a sunrise tour, a sunset tour, or complete island tour. No matter which one you choose, your guide will take you to some of the most picturesque places on Oahu, so you can capture the perfect photo to remember the natural beauty of Hawaii. No matter where you turn in Hawaii, you’re likely to find a beautiful place to photograph, but some locations are more photo-friendly than others. So, check-out these family photo spots or book your photography tour—and, snap away!